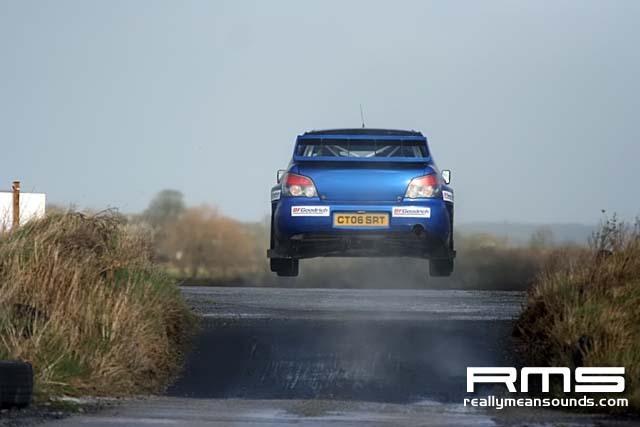 Last Saturday’s McGrady Insurance Stages, round two of the Pacenotes MSA Northern Ireland Stage Rally Championship, saw 2002 champion Derek McGarrity return to the top of the podium! 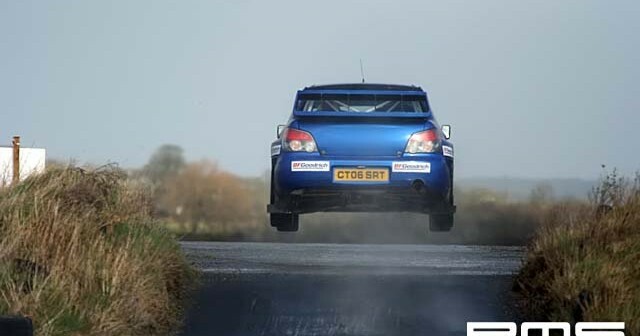 Piloting a latest specification Subaru Impreza WRC S12b, the Glengormley driver dominated the six stage event at Bishopscourt, winning by more than half a minute from Connor McCloskey and Francis Regan! The victory marks McGarrity’s first rally win since his huge accident on the Isle of Man in 2006, which has since seen him undergo numerous operations on his arm. Indeed, the Glengormley pilot admits that he still only has 75% movement, and will undergo another operation at the end of the month. But this failed to stop him from laying down the gauntlet at Bishopscourt! In what was his first event of the season, McGarrity immediately set the pace, going fastest on the opening rain-soaked test by eight seconds from 21-year-old Connor McCloskey. Navigated by Dairmuid Falvey, the tide was very much in the number one seeds’ favour, as they were fastest again through stage two. The second stage saw McCloskey edge closer, as he set a time just three-tenths of a second off the pace. That was to be the closest he would come to the rally leader all day though, as McGarrity’s experience, combined with the latest technology in machinery, proved to be an impossible combination to beat around the County Down venue. McGarrity stayed cool, calm and collected throughout all six stages, and while he was surrounded by dramas involving the rest of the field, the Glengormley pilot emerged victorious by 35 seconds. He takes maximum championship points away from the venue, but insists that he has no plans to contest the entire series. "I’m going to concentrate on running cars for the likes of Mark Higgins this year," McGarrity said. "I might do the odd event, and I’d quite like to do a few gravel events across the water towards the end of the season. Bishopscourt was brilliant but I don’t want to get involved in a championship." That’s good news for young Connor McCloskey, whose second overall finishing position was enough to promote him to the head of the championship standings. After narrowly missing out on victory at round one at Kirkistown, which went in Sean Devine’s favour, it was McCloskey who was all smiles at the finish on this occasion. "Thank God that’s over!" a jubilant McCloskey said at the end of the final stage. "We tried hard to stay in second position all day so it’s great to get the result!" The expected challenge from round one winner Devine failed to materialise at the Bishopscourt event. A stage one excursion after the infamous jump saw him burrow a hole in a row of tyres. He escaped with frontal damage but later retired after stage three. Devine’s demise left Glenn Allen and Raymond Johnston battling for third overall after Denis and Stuart Biggerstaff also had an early bath when a gearbox problem developed in their Subaru. Allen and Johnston locked horns but it was Allen who gently edged away until a problem on stage five saw him lose 12 seconds. That was enough to allow Enniskillen’s Johnston into third position, and with one stage remaining, he held the advantage by 1.5 seconds. A no holds barred attack was on the cards for both men through the final stage, and when Allen caught some traffic, he thought his chances were ‘jugged’. Lady luck was on Allen’s side on this occasion though. Despite finishing the stage with smoke billowing from underneath his car, thanks to collecting one of the circuit’s tyres, the reigning champion managed to seal the final podium spot after Johnston spun off the road! "There was a corner which we had been taking in fourth gear all day and I thought I’d try it in fifth!" a smiling Johnston said at the finish. "But the car wasn’t happy with it and we went off!" Johnston incurred a maximum time as a result, and such was the close competition, it dropped him to 79th overall. That allowed Stephen Kelly and Ann Taggart into fourth overall, and they grabbed the Sunoco Fuels Group N spoils in the process. A late charge from Rodney McKnight and Seamus Donnelly saw them finish just three seconds in arrears, while Kieron Graffin and Mark Hamilton nipped home in sixth. Early Group N leaders, Alan Carmichael and Margo Christie, had to settle for seventh overall at the finish. They had been running well up the order but an ‘off’ on stage four saw them lose more than half a minute. A great recovery drive followed to see them net seventh overall, ahead of Mark and Cormac Doyle who completed the top eight. In the Superdrive two-wheel-drive category, James Kennedy and John Rowan emerged victorious for the second event in succession. They battled throughout the day with Rodney White, but eventually emerged as the victors by a slender eight seconds. White and navigator Janet Craine finished second while Bob Riddles and Peter Ward were third. With round two of the Pacenotes MSA Northern Ireland Rally Championship completed, competitors are already getting ready for the third round of the series which will take place in less than two weeks time. The NI247.com Circuit of Ireland National Rally will take place during the Easter weekend on Saturday 22 and Sunday 23 March. It’s the only two-day event in the championship, and with plenty of demanding closed road stages on the cards, competitors will be revelling in the challenge. Further information can be found on www.nirally.com. Images of most competitors available, please email [email protected] for more.